I am putting together a bunch of packages to send to my friend Eric and his troop currently serving in Afghanistan. My friend Eric is a former teacher (though I wonder, are we ever former teachers?) and when I asked him what he wanted me to send him, all he asked for was stuff for the children of Afghanistan. One girl in particular he said has tattered shoes- he promised her he'd get her a new pair of shoes from the United States. So I took up a collection at school. If students wanted to they could donate items or money and I'd go shopping. Anyway, I received many many generous items, but one student gave me several pairs of brand new sneakers. 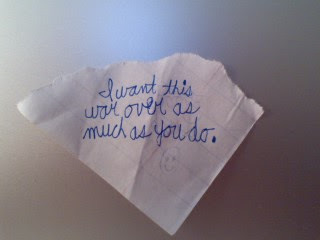 As we're packing the shoes tonight, Matt discovered this tiny note, slipped into one of the shoes. I think it's just the most touching thing ever- a tender, simple thought. I don't know, it's just amazing. The boy who did it is a highly functioning child with a form of autism. He is the center of his classmate's universe and a student who I see as an absolute angel. 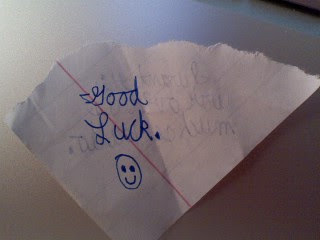 Well, I found his little note and I'm not leaving it tucked into a shoe. I'm going to take it out and tape it prominently to a letter to my friend who will undoubtedly love it.